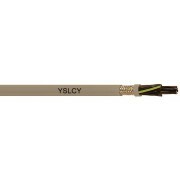 Cable standard : DIN VDE 0276-604, DIN VDE 0276-627. 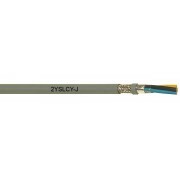 Halogen free : EN 50267-2-2, IEC 60754-2. Fire retardant : EN 60332-1-2, EN 60332-3-24. Low smoke generation : EN 61034. 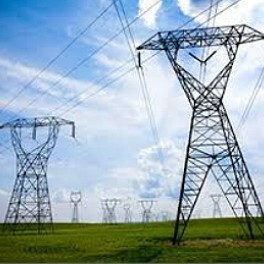 Nominal voltage Uo/U : 600/1000 V.
Test voltage : 4000 V (A.C.). Service temperature : -30° C till +90° C.
Bending radius : min. 12 x diameter. DIN EN 60228 Class 5. Core identification : 4 cores: bk, br, bl, gn-ye coloured cores. 1.Screen : aluminium polyester tape. Outer Sheath : PVC compound. Sheath Colour : RAL 7001, Grey (to be agreed upon the shade of grey). Insulation : HEPR, G7 quality. Filler : not fibrous and not hygroscopic. Sheath : thermoplastic, M1 quality*. 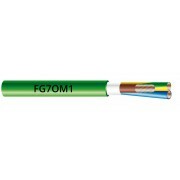 FG7M1 - for one core cables. 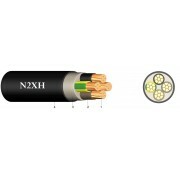 Conductor : class 5 flexible copper. Insulation : HEPR having G7 quality*. Filler : non fibrous and non hygroscopic. 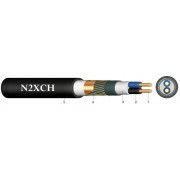 Outer sheath : PVC sheath in RZ/ST2 quality. 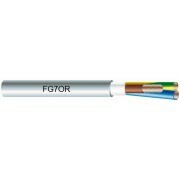 FG7R - for one core cables.